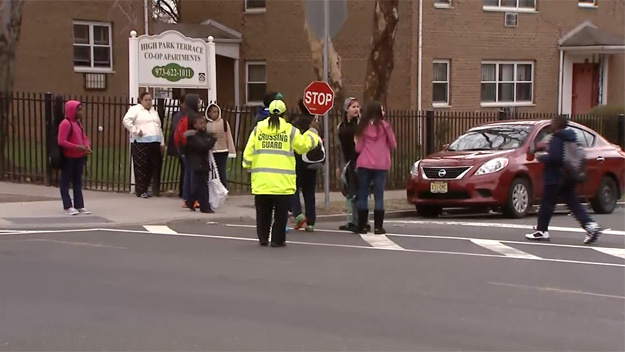 Mayor Ras J. Baraka announced today that the City is in the process of recruiting 60 additional Newark residents as part-time crossing guards. The added guards will increase the level of safety for children crossing streets on the way to school. The additional guards will increase the number from 101 to 161. From 7 to 9 a.m. and 2 to 4 p.m., crossing guards work at intersections near elementary and middle schools that traffic studies have identified as problem areas in need of coverage. Applicants go through a hiring process that includes a comprehensive criminal background check that investrigates their driving, financial and employment histories and asks about residency history and other relevant information. A classroom training of two hours or more including information on methods of traffic control and the duties and responsibilities of crossing guards is conducted by police personnel, and in-service training is conducted either by an experienced crossing guard or by police personnel.